Lately every lesson I teach is being made into a game. A competition. A table versus table bonanza. I love everything about teaching this way. I could go on and on about all of the wonderful things I see and teach when I structure a lesson as a game- from motivating my lazy bones students to teaching kids that there actually are winners and losers in our world. No, everybody doesn’t get a prize. And yet everybody lives to see another day. But keep coming back, because the next winner may be you! 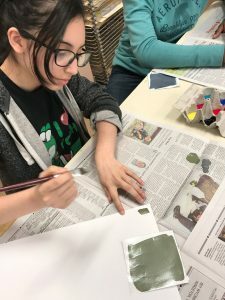 Every seventh grader learns to paint a 12-color color wheel using only the primary colors (red, yellow, blue). This is a necessary skill for any painter to be able to do. But even though they do it once with me and once as a quiz, I’m seeing kids the very next class asking how to make orange. We just did that! Twice! AAAuuugh!! 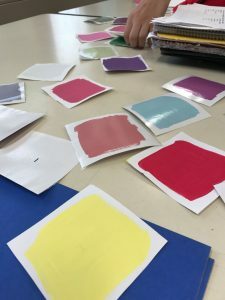 Also, the most joyous moments for students are often at the end of class, when they start swirling all of their colors together or fold their newspaper in half to make Rorschach like paint blots. Kids work as a table, not as individuals. Tables are given a half of an egg carton with the colors Red, Magenta, Blue, Turquoise, and Yellow inside. White is free to use as much as is needed. Next, kids choose paint swatches (made using the paints they have access to). Each paint swatch has a point value on the back based on how difficult it should be to match. Tables decide if they want to work together on one swatch or diversify and each take a different one. Then the fun begins. Kids start mixing and matching colors, talking excitedly about whether they have the perfect purple or whether it needs more blue. As they work, I can start talking with them about whether their gray is too ‘cool’ or too ‘warm’, and they get it! Without my ever teaching them such a concept, they are grabbing onto it and applying it immediately. I am seeing kids think about color more than I ever have before. It’s crazy! I tell kids that one of the biggest part of any career in art is the ability to match colors. Whether you’re a painter, an Interior Designer, or you work at Lowes in the paint department, the ability to see and match colors is one of the most broad and useful skills you can attain in art. 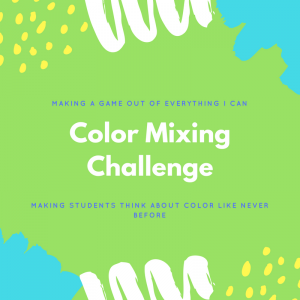 This color mixing challenge is fun, yes, but even more importantly it’s helping kids to hone one of the most fun and useful skills I can teach. 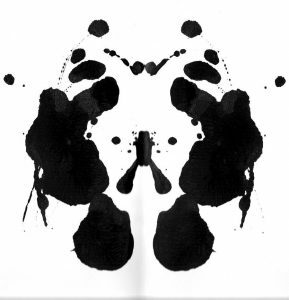 And if they see a Rorschach-like mermaid in one of their paint blots, well that’s ok too. This entry was posted in Uncategorized by jtlart. Bookmark the permalink. Yippee! The more the merrier!